The Society has been working on integrating the GSV Blog with the main GSV web site and we are now getting ready to switch over to the new system. The purpose of this test is to confirm that the new system is working as expected and that subscribers to the Blog receive the automatic email notifications in accordance with their preferences. We expect to have the new Blog operational within the next few days at which point you will be able to access the new Blog as an integral part of the main GSV web site. Shortly afterwards, the current Blog which has its own web site address will be closed down. Even though lots of things don't happen in January after our hectic Christmases, life actually keeps on going! Just like the DNA DISCUSSION CIRCLE which will have a meeting in January on Wednesday 9 th. at 10.30 am - 12 pm, as shown in our latest Ancestor journal in 'Around the Circles' (but unfortunately missed out in the 'What's On in January' section. Our apologies. You can find out more about this interesting discussion circle on our website HERE. THE GSV CENTRE WILL BE CLOSED FOR THE CHRISTMAS -NEW YEAR PERIOD ON SATURDAY 22 DECEMBER TO TUESDAY 1 JANUARY INCLUSIVE. Later in January the Early English (the Discussion Circle, that is) will meet on Wed 23 and London Research on Thurs 24. The following week on THURSDAY 31, Stephen Hawke will talk on New Poor Laws - post 1834. Plan your January and see the website to book and find out what other Classes and focussed research assistance is available (Scotland and Ireland). Family history and DNA focus group - invitation to participate. For GSV members only - 25 and 27 July. We need YOU to help us understand how genetics is understood. Have you had your DNA tested for family history? Are you interested in having your DNA tested for family history investigation? Are you worried about issues to do with privacy, ethics and bio data? Has testing your DNA changed your family history story? Free of charge. Maximum of 12 participants. Bookings are essential and can be made online, http://www.gsv.org.au, by email, gsv@gsv.org.au, by phone 9662 4455 or in person at the GSV (9.00 am to 4.00 pm Mon - Fri). Research Leader: Dr Jerome de Groot, Manchester University. The "Double-Helix" project is investigating what people think about genetic science and how it affects them. In particular, the project is interested in talking with family historians about their experiences of commercial DNA services offered by MyHeritageDNA or Ancestry.com. Two separate focus groups will be run at the GSV Research and Education Centre on 25th and 27th July. These are discussion groups for people to share their experiences. The sessions will be structured debate and discussion, encouraging participants to share their experiences. The discussions will be recorded for research purposes. Any use of the discussion will be agreed with participants. No biodata or information relating to genetic data will be sought. Read more about Family history and DNA focus group - invitation to participate. South West England Research & Discussion (SWERD) is one of a number of Discussion Circles that the GSV hosts for its members. These are part of the annual membership and there is no limit to the number you can participate in, beyond your own time. Doing your own research can be exhilarating but having the chance to share your problems, and findings, with others is even more fun. We had a very full house, with 45 attendees at the meeting (including four new SWERD members and some visitors from the DNA discussion circle). Dr Joe Flood is both the Administrator of the Cornwall DNA projects on the FamilyTreeDNA website and also runs a One Name Study on the Coad and Coode surnames. DNA research has been particularly useful in resolving brickwalls and establishing global connections for the Coad and Coode family researchers. Joe’s presentation included interesting anecdotes on the family myths, surprises and new social connections found through combining the One Name Study and DNA research. Firstly, we covered the use of autosomal DNA research – this included commentary on the relative costs and ‘usefulness’ of the offerings from the various DNA test providers. This aspect of research is particularly useful for confirming family connections and uncovering ‘new’ cousins. Next we turned to Y DNA research – the research that follows the male-line. Again, this has proved very useful for resolving brickwalls and Joe provided examples of successes in extending and joining the various Coad/Coode family trees. The research pages Joe administers on the FTDNA website currently have 600 members on the Cornwall project (autosomal DNA research) and 120 members on the Cornwall Advanced Y DNA project. Joe advised that there is also a project page for those with Devon origins. These projects are free to join (after you’ve done your DNA test), the data and discussion sections are a great learning tool and they provide the opportunity for feedback and help from very experienced researchers. I’m a fan – I joined both projects with my DNA test results a few months ago and straight up connected to some ‘new’ third cousins here in Melbourne who’ve provided fantastic photos (late 19th and early 20th century) and new aspects to our shared family history. The final section of Joe’s presentation turned to some of the deep ancestry material, including the DNA connections of some members of the Cornwall DNA projects to the Beaker people who settled in Britain and Cornwall several thousand years ago. This aspect of the research has also found some pockets of ‘very rare DNA’ amongst some members of the Cornish Advanced Y DNA project. Joe is keen for more of us with Cornish heritage to join the FTDNA projects to help expand his and your research and findings. I’m afraid my notes are not doing Joe’s really interesting presentation justice. Fortunately, Joe has made a copy of the presentation available to SWERD members and it has plenty of detail in the slides to show the depth and detail you can take up in using DNA research. I’m also aware that this is a complex area and to help you through that complexity GSV is rolling out a number of new education sessions on different aspects of DNA research. There are some details in the current issue of Ancestor and keep an eye on the GSV website for updates. These will be popular, so make sure you register ASAP for these to secure a place. The first session is on 17 April – you can book for this through the ‘All Events’ section on the frontpage of the GSV website. I also want to acknowledge Joe’s dedication and generosity in providing his presentation at GSV. He is still recuperating and went above and beyond the call of duty in providing us with his very informative presentation. Thanks also to one of our members who saw to Joe’s safe homeward journey. The next meeting will be held on Friday 13 April 2018, 12:30 to 2:00pm. The discussion topic will be 'Our poor ancestors', with a focus on Poor Laws and workhouses in the southwest. Many of us had ancestors who were subject to the Poor Laws or who spent time in workhouses and we’ll look at the materials available to research their lives. Start thinking on what you know of your poor ancestors in the southwest and how you've researched them, and come along to join in a fascinating discussion in April. If you are not a GSV member, join up and join in! The DNA Black Friday Sales are now in full swing. Should you take advantage of any of the sales? Which DNA test should you take? Don't worry if you miss AncestryDNA and My Heritage's tight timeline. FamilyTreeDNA offers the same test (which they call Family Finder). Here a few hints and some general information that may help you make your decision. If you haven't taken a DNA test before and are merely curious then purchase a test for the biggest database - AncestryDNA. It seems logical that the larger the database the more likely you are to get results. You can download your AncestryDNA test to other testing companies further increasing your chances of getting DNA matches. The reverse doesn't apply. You cannot upload a test from another company to AncestryDNA. If you are interested in your ethnicity then estimates of your ethnicity are included in tests provided by AncestryDNA, FamilyTreeDNA (in their Family Finder test) and My Heritage. The comments below about National Geographic and Living DNA may also apply here. This Y DNA and Big Y offer comes with risks. The first of which is understanding the best way to take advantage of the offer! Sometimes, and Y DNA is one of those times, it is better to do things in baby steps. And this is one package you need to convert the offer to Australian dollars to see what the upfront cost is. Doing the same thing over a few years is less painful to the hip pocket (though still painful let me assure you). If you have a brick wall along your direct maternal line then look at FamilyTreeDNA's mtFull Sequence. However, I've yet to see anyone with a good match with mtDNA. This is because the mutation rate is so very slow. All I'm saying is don't get your hopes up with mtDNA tests. If you are REALLY, REALLY, REALLY, REALLY curious about paleo anthropology or your ancient origins consider testing with National Geographic and with Living DNA. Both Geno 2 and Living DNA offer more information than is given with FamilyTreeDNA's Y DNA and mitochondrial DNA tests but nevertheless are still expensive when compared to some of the other tests. So, ladies find a brother to take these tests for you. Having decided which test or tests you wish to purchase there are some other things worth considering. Tests purchased now can be used later. If you are going to a big family reunion in 2018 or 2019 consider purchasing some tests now for on the spot testing at the reunion. Include freight in your calculations. FamilyTreeDNA and National Geographic quote in $US. The current exchange rate is about $US 1.00 to $AUD 1.30. We have been over whelmed by the interest shown in attending our seminar "DNA for family historians" on Remembrance Day this coming 11th of November. We have delayed holding this seminar until just before the expected sales by DNA testing companies later next month. So that no one misses the opportunity to attend we are moving it to the Community Hub at The Dock, 912 Collins Street, Docklands. The times will be the same with Registration from 9.00 am, the first session starting at 9.30 am and with an expected 12 noon finish. To book and for more information go to Events (under the Activities tab on our website). Please take careful note of the directions to the Community Hub at The Dock and don't confuse it with a similarly named venue. This week Patsy Daly from the GSV's DNA Discussion Group cautions us about the meaning of ethnicity as presently estimated by DNA-testing companies. GSV is holding a Seminar on DNA for Family Historians on Saturday 11 November at which Patsy will present more information about the DNA-testing available, as well as case studies. You can book for this at https://gsv.org.au/activities/civi-events.html?task=civicrm/event/info&reset=1&id=684. 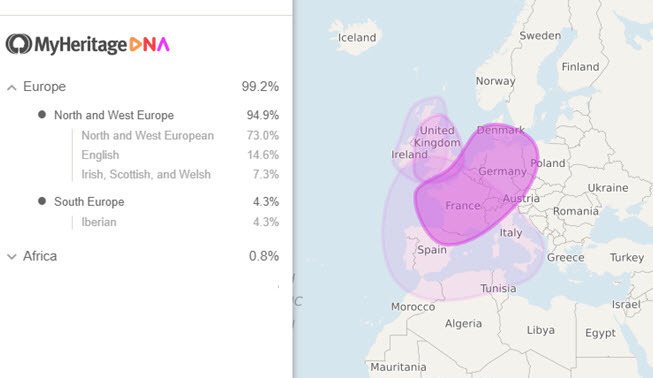 The major DNA testing companies, AncestryDNA, FamilyTreeDNA and My Heritage, each offer an estimate of ethnicity in the DNA results they give to family historians. Most of us measure this ethnicity estimate against the expectations we have, arising from our knowledge of our family trees. But this is actually quite inappropriate, as an ethnicity ‘estimate’ is just that – an approximation or an educated guess. No company is able to calculate our ethnicity by following all our family lines back to a certain point in ancient times. More's the pity! Our ethnicity estimate is based on our ancient origins – thousands of years before political boundaries were set. Consequently, a map of our ethnicity may cross current political boundaries. Indeed, even our ethnicity categories may overlap those boundaries. Nor is there a link from the estimate of our ethnicity back to the family tree that is founded on family stories and written records of very recent times. In fact, our ethnicity is estimated by comparing our own DNA sample against a reference panel of DNA samples. As each testing company gains more experience and has access to a greater number of DNA results, our ethnicity estimates will be refined and changed. Don't expect your ethnicity estimate to be set in concrete. Because each of the three major testing companies may use difference reference panels and use different procedures our ethnicity estimate may vary from testing company to testing company. In addition, testing companies may not yet have enough samples in their current reference panel to identify some non-European ethnic groups. For example, at present those with Australian indigenous ethnicity may only be identified at a higher level - as Micronesians. An estimate of our ethnicity depends upon the DNA we received from our parents, but while our ethnicity estimate may be like that of our siblings, only in the case of identical twins is it precisely the same. Overall, it is probable that our ethnicity estimate is only accurate at the continental level, so while it is interesting to see how nearly an ethnicity estimate matches our expectations it is, at this stage, probably more worthwhile to compare our ethnicity estimate with those of our DNA matches. It is in this comparison that we might find the answers to questions of relationships. Those who are chasing DNA and exploring genetic inheritances might be interested in the latest blog entry by renowned Irish genealogist, John Grenham. John's unique style, great curiosity and fascinating insights always make for interesting reading, whether or not your heritage is Irish. This blog is no exception. Read more about Are you chasing DNA?